Venerable Thich Tinh Hanh was born in 1934 in the southern Vietnam province of Ninh Thuận. When Tinh Hanh was 15, the death of his maternal uncle triggered an insight into impermanence, whereupon he resolved to go forth into the monastic life. In the following year he enrolled at the nearby Buddhist institute, and at the age of 17 he took the monastic vows with Venerable Thich Huyen-Vi as his preceptor. At that time he received the Dharma name Shiyuan, the ordination name Tinh Hanh, and the style Xingbei. In 1979 he set up the Linh-Son Lecture Hall, where he opened classes in qigong and meditation. Afterwards he established the Linh-Son Buddhist Institute, the magazine Modern Buddhism Monthly, the Buddhist College of China, and the Linh-Son Zen Lin Temple. At the same time, in an effort to make Buddhism more relevant to modern society, he organized a variety of lectures and classes on various themes related to “humanistic Buddhism.” In 1990 he established the Linh-Son Culture & Education Foundation and began serving as its director. In the same year he was appointed as assistant professor at the National Taipei University of Education, thereby becoming the first Buddhist monk with a doctorate to teach at a national university in Taiwan. In 1992 he also began teaching in the Chinese Department at National Zhongxing University. 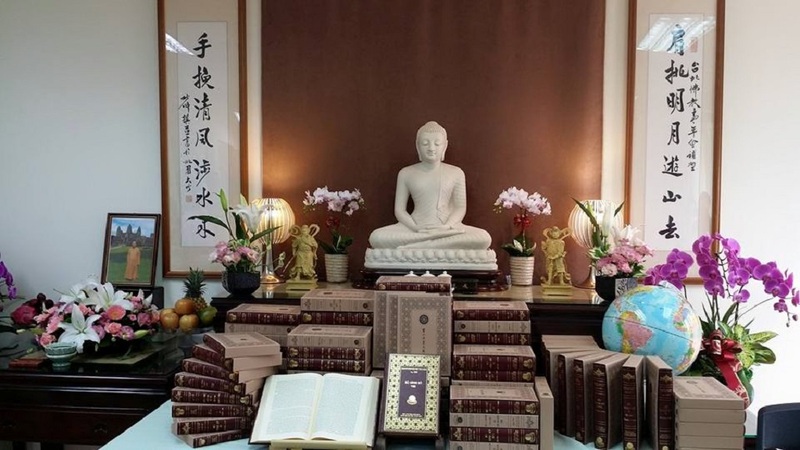 Thich Tinh Hanh lamented the fact that, even though Buddhism had come to Vietnam over 1,000 years ago, there was still no complete collection of its scriptures in Vietnamese. Thus in 1993 he initiated a project for translating the entire Chinese Buddhist Canon into Vietnamese. Over the course of two decades this project has produced an enormous amount of translations, including the Taisho Tripitaka (volumes 1 to 54); the Xuzangjing; the Vinaya Pitaka of the Pali Canon; and the Guhannanwen jingshu. A number of modern works have also been translated, including The Collected Works of Master Taixu; The Collected Works of Master Yinshun; Encyclopedia of Chan (100 volumes); Encyclopedia of Pure Land; the Haichaoyin book series; and the Foguang Dictionary. All of these translations have been collected into a 187-volume set titled Linh-Son Dharma Treasures; up to 2015, 500 sets have been published. After being appointed head of the Linh-son World Buddhist Association in 2005 Tinh Hanh established the World Linh Son Oriental University in Paris, which in 2010 received permission from the French government to begin recruiting students. Tinh Hanh died on April 10, 2015 at the Linh-Son Zen Lin Temple in northern Taiwan. He was 81 years of age; he was a monk for 65 years, and a fully ordained bhiksu for 61 years. The abundant fruits of his various translation projects stand as a lasting testament to his many contributions to the field of Buddhist education and scholarship.